In Matthew 17:14-21, a story is told of a man bringing his son to the disciples/Jesus for healing from a horrible curse: seizures would throw the boy into the fire or water. Disciples frustrated and unsuccessful, the dad went to Jesus begging for help. 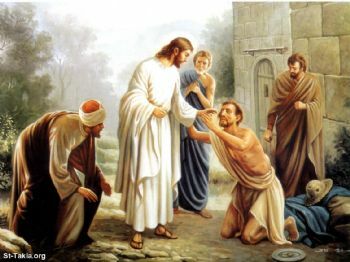 Jesus healed the boy and then responded to the confused disciples. Jesus told them a couple of things. First, they needed belief--even the faith of a mustard seed would be powerful. Second, this kind required prayer and fasting. I know it could be perceived to be insensitive or arrogant to compare someone with seizures or demon possession to myself--who doesn't have those disabilities. But I do have my own problems. I struggle with self-discipline to manage my health and fitness. I struggle with insecurities and even depression. But I do think it is fair to compare my own problems to those of others in so much that whatever my eyes are focused on, to me my problem is as big as a mountain. My problems throw me down flat to where I feel like I am getting burnt or drowning emotionally (not physically). Can the formula presented by Jesus help me, too? I hope so. Faith that He can heal, prayer and fasting to focus on Him and my need for him . . . to increase my faith---these are some tools I can incorporate into my life. Disclaimer: I don't mean to imply that faith alone in God's healing power is all that is needed for health and success. Even in the story, Jesus stated that this circumstance was unusual and special. I do feel God has given us wisdom and opportunities to grow and improve our status. I am amazed at the resources SparkPeople has as tools for structuring our successful journey to health. Friendship, education, medication, family, goal setting, accountability---they all are important to our well-being. But a gentle reminder that faith, prayer, and personal sacrifice have a place in our overall health as well. Our problems, regardless of how small other people may feel they are, are just as real and overwhelming as the person dealing with huge issues. They can be financial, physical, mental - the list is endless. However, casting our problems, small and large, upon God gives us the courage and fortitude to face and handle those things that could destroy us. 1 Peter 5:7 King James Version (KJV) - Casting all your care upon him; for he careth for you. Thank you for sharing and be diligent in casting your care upon Him; He will not fail!